Women’s soccer traveled four hours north to take on the Bates Bobcats in chilly Lewiston, Maine this past Saturday, Sept. 22. Going into the matchup, the team had not won a regular season matchup against Bates since 2012 and lost a tight game last year 1-0. They ended the streak with a 2-1 victory, led by Gianna Argento ’21’s pair of back-netters. From kickoff, it appeared this year’s matchup would be different. After a few half-chances on net, starting defender Julie Meehan ’20 tossed a throw-in deep into Bobcat territory. Impact first-year midfielder Melissa Wilhelm, who has earned a starting spot in all seven games this campaign, one-time played the ball to Argento. In front of net, Argento made no mistake and tapped the ball in to earn her second goal in as many games just 11 minutes into the half. Despite her raised profile as a goal-scorer, the Bobcats failed to clamp down on Argento just over 15 minutes later, as she added a second goal unassisted. After only making the scorer’s book once freshman year with an assist, Argento has tallied three goals, one assist, and 15 shots on goal only seven games into the 2018 campaign. The Cardinals dominated the remainder of the half, putting eight shots on Bobcat goalie Katherine Nuckols. The defense held strong and prevented any shots or corner kicks for the full 45 minutes. The Bobcats came out firing the second half and put seven shots at the Wesleyan goal with four on target. In minute 63, the Bates’ forward Riley Turcotte found the back of the net for the second straight game, cutting the Cards’ lead in half. Eighty-two minutes in, the Bobcats nearly equalized, but a stellar save by Zoe Cassels-Brown ’20 maintained Wesleyan’s lead. Cassels-Brown’s contribution to the team this year has lifted Wes to new heights, as her goals allow per game average is a low .44, improving on last year’s average of .59. With the final whistle, the Red and Black moved to 2-1 in conference, already improving on last year’s conference win total of one win and good for an overall record of 5-2. The loss pushed the Bobcats to 0-4 in conference and 2-4 overall. Next up on the schedule is a conference showdown against the Hamilton Continentals, who nearly upended number one ranked Williams to open its season. The game is home at 11 a.m. this Saturday. 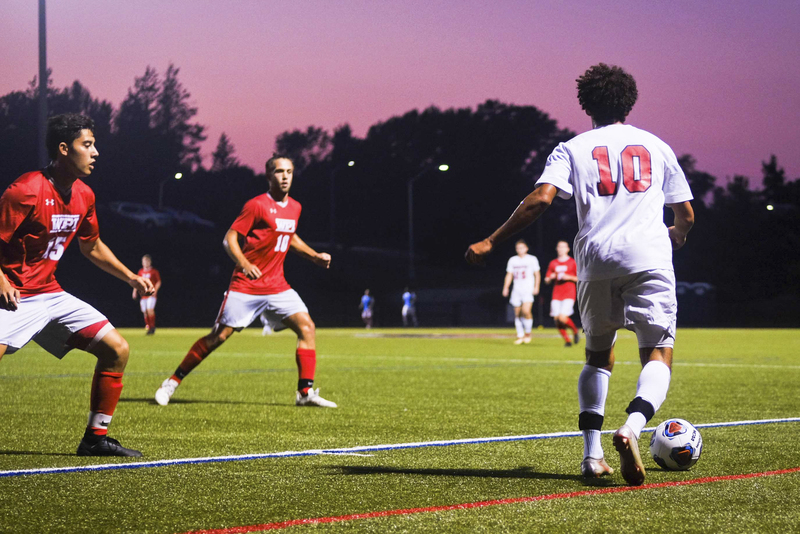 Men’s soccer went head-to-head with Bates this past Saturday as well. Last season, the Cards defeated the Bobcats at home 4-2 for their first conference win. The Bobcats scored early in the first half, as a goal from Peder Bakken put the home team up by one. Wes was unable to get off a shot on a strong Bates’ defense, and the first half concluded with a score of 1-0. With the second half came a number of chances for the Red and Black. A brilliant run forward by J.J. LaCorte ’22 nearly saw an equalizer, but a diving stop by goalie Robbie Montanaro kept the score level. Along with this shot came two other quality looks and five corner kicks, out pressing the Bobcats 5-1 overall in corners. The chance creation ultimately was not enough, and Wesleyan failed to capitalize before the end of regulation. The loss moved the Birds even on conference play at 1-1 and to an overall record of 2-3. On Wednesday, the men’s team traveled to Medford, Mass. to take on the No. 3 Tufts Jumbos, who won a national championship in 2016. The Red and Black were plagued by many of the same issues that the Bates matchup presented. In the first half, the Cardinals matched Tufts for chance creation and were only outnumbered in shots by a 9-7 margin with each goalkeeper forced to make three saves. However, the second half saw a physically taller Tufts team take advantage of height 63 minutes in. Off one the team’s nine corner kicks, Joe Braun managed to find the back of net and put the Jumbos in the lead 1-0. It was a lead Tufts that would hold, maintaining a perfect season of 7-0-0. The Cardinals fell to 2-4 overall and a 1-2 record in NESCAC play. Next up for the men is another conference showdown against Hamilton. This one will be battled out at home at 1:30 p.m. on Jackson Field.